When the piston is at its top most position, i.e. the piston is closet to cylinder head, it is called top dead centre. When the piston is at its lowest position, i.e. the piston is farthest from the cylinder head, it is called bottom dead centre. The inner diameter of the engine cylinder is known as bore. It can be measured precisely by a Vernier calliper or bore gauge. As the engine cylinder wears out with the passage of time, so the bore diameter changes to a larger value, hence the piston becomes lose in the cylinder, and power loss occurs. To correct this problem re-boring to the next standard size is done and a new piston is placed. Bore is denoted by the letter ‘D’. It is usually measured in mm (S.I. units) or inches (metric units). It is used to calculate the engine capacity (cylinder volume). If D is in cm and L is also in cm than the units of V will be cm3 which is usually written as cubic centimeter or c.c. The volume above the T.D.C is called as clearance volume, this is provided so as to accommodate engine valves etc. this is referred as (VC). The volume swept by piston while moving from T.D.C to B.D.C is called swept volume. This is referred as (VS). 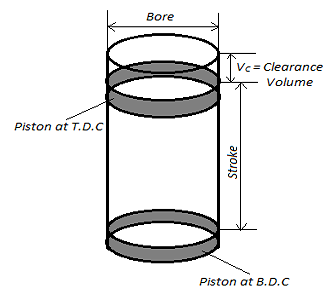 It is the ratio of volume above the piston at B.D.C to the volume above the piston at T.D.C. It is the ratio of total volume of the cylinder (VS + VC), to the clearance volume (VC). For petrol engine, it ranges from 8 to 12. For diesel engine, it ranges from 15 to 24. It is the work-done in a given period of time. More power is required to do the same amount of work in a lesser time. The power developed inside the engine cylinder is called the indicated power. 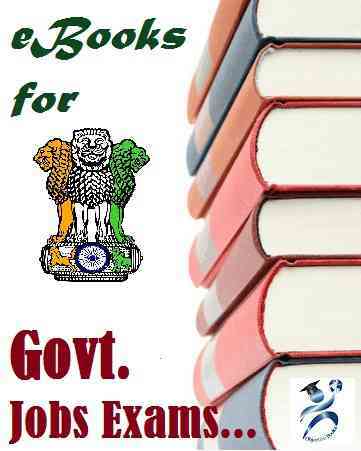 It is expressed is kW. It is given by the area under engine indicator diagram. The theoretical or hypothetical indicator diagram is always longer in size as compared to the actual one. Since in the former losses are neglected. The area of the indicator diagram represents the magnitude of the net work-done by the system in one engine cycle. The ratio of the area of the actual indicator diagram to the theoretical one is called diagram factor. This is the actual power available at the crank shaft. The indicated power minus various power losses in the engine like, friction and pumping losses in the engine, gives brake power. It is measured by using Dynamometer and expressed in kW. Mean effective pressure is that hypothetical constant pressure which is assumed to be acting on the piston during its expansion stroke producing the same work output as that from the actual cycle. As piston performs power stroke, cylinder pressure decreases. Thus it is required to refer an average effective pressure throughout the whole power stroke. It is expressed in bars. The constant depends on the mechanism used to get the indicator diagram and has the unit, bar/m. It is the force of rotating action about the crank axis at any given instant of time. K = Number of cylinder. r = Effective crank radius (m). Also, rk = re x rc. my name. Powered by Blogger.